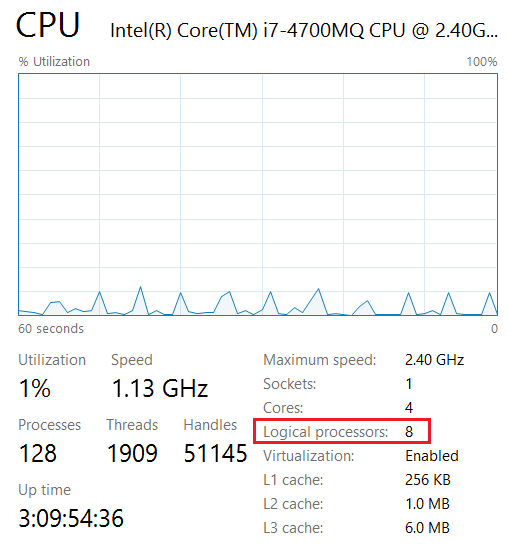 How many CPU cores does your machine have? Here's a screenshot of my machine. It's showing 4 physical cores & 8 Logical Processors. More cores are usually associated with better performance. From Go 1.5 onward, by default, Go programs run with GOMAXPROCS set to the number of cores available; in prior releases it defaulted to 1. This will definitely improve the performance of Go programs. Here's the code to find out number of CPU cores/Logical Processors in your machine. The function NumCPU() returns the number of logical CPUs usable by the current process.